Tuesday, March 12, 12:30 – 3:00 p.m. 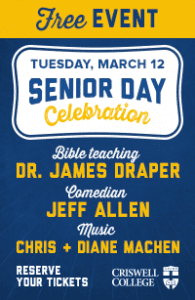 The 2nd Annual Senior Day Celebration is designed for Baby Boomers and Senior Adults, but all ages are welcome. Contact Ted Eaton at teaton@fbckeller.org for more information.